diaphragmatic hernia protrusion of some of the contents of the abdomen through an opening in the diaphragm and into the chest cavity. The condition may be congenital or acquired. Congenital diaphragmatic hernia in newborns is due to failure of the embryonic diaphragm to fuse. The opening in the diaphragm can be large enough to permit filling of the thoracic cavity with abdominal contents, thus interfering with normal expansion of the lungs. This produces respiratory distress, which is the outstanding feature of neonatal diaphragmatic hernia. hypoxia results from persistent fetal circulation that produces a right-to-left shunting via the foramen ovale and patent ductus arteriosus. The severity of symptoms and age of onset depend on the extent of hypoplasia of the lungs and the degree of interference with ventilation. The condition constitutes a surgical emergency. Without immediate and successful intervention the neonate is likely to succumb to rapid and progressive respiratory failure. At the moment of birth the neonate with this condition will show some degree of respiratory distress. The abdomen may appear sunken and the anterior-posterior chest diameter enlarged. Because the position of the heart can be shifted by the herniating organs, heart sounds are often heard on the side opposite the hernia, and bowel sounds may be heard in the chest cavity. A simple x-ray of the chest and abdomen will demonstrate loops of bowel in the chest, with the mediastinum shifted toward the contralateral side. Surgical repair of the hernia and restoration of internal organs to their rightful place should be done as soon as possible. Before surgery the neonate is stabilized without delay. Nasogastric decompression is begun; intubation and assisted ventilation with supplemental oxygen may be necessary. Postoperatively, the infant may remain extremely critical; at times extracorporeal membrane oxygenation will be necessary until the persistent fetal circulation resolves. It has been found that the survival rate for these neonates is greatly improved if they are cared for in an environment that is quiet, soothing, and as nonstressful as possible considering the intensive monitoring and care they must have. Diaphragmatic hernia in the adult usually is a sliding type of hiatal hernia; that is, a part of the stomach slides upward into the thoracic cavity, following the normal path of the esophagus through an enlarged hiatal opening in the diaphragm. Causes include congenital weakness of the structures, trauma, relaxation of ligaments and skeletal muscles, or increased upward pressure from the abdomen. It is most often found in persons of middle age or older. Small sliding hiatal hernias are found in the majority of persons undergoing an upper gastrointestinal series. 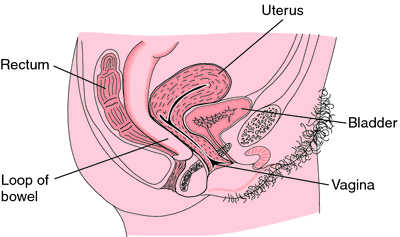 Most are asymptomatic and do not require treatment. 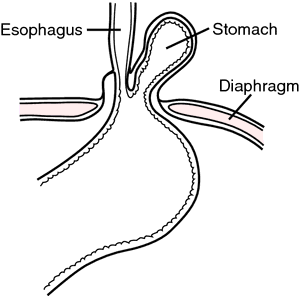 Those causing symptoms do so because of inflammation of the esophageal lining resulting from gastroesophageal reflux. Typically, the symptoms occur after a full meal and include heartburn and indigestion. Large sliding hernias can cause intermittent abdominal and chest pain, difficult breathing, and cardiovascular symptoms. If the herniated portion of the stomach becomes incarcerated or is perforated, there is sudden sharp pain under the sternum and symptoms of obstruction. Although this rarely occurs, it is a surgical emergency. The preferred treatment consists of small meals of bland, easily digested food, moderate exercise, and sleeping with the upper part of the body in a raised position. Surgical repair involves invasion of the abdominal and thoracic cavities and is reserved for severe cases that cannot be managed medically. Rarely used term for diaphragmatic hernia. 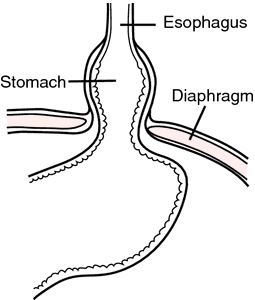 A hernia of the diaphragm.